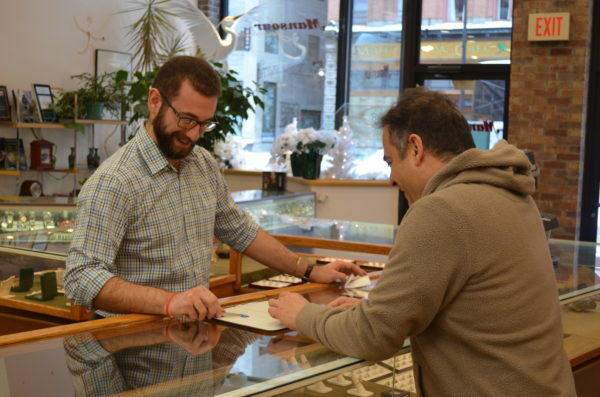 For Ithaca residents and downtown visitors who are looking for the perfect piece of jewelry and exceptional customer service, head over to the family owned Mansour Jewelers on the Commons. As you walk in you will be met by the family member who is running the store, Michael Abdulky. Chat with him and you’ll know how they have built their business – through lasting relationships and commitment to their customers. Michael is born and raised in Ithaca and an Ithaca High School Alum. He has been working at Mansour for over 4 years, and has been running the store as Manager for the last 2 years. That is just a blip in the 39 years Mansour Jewelers has been in business – all of them family owned. Michael’s father, David, built the business and ran it for 35 years before Michael joined. As Michael noted – he would love to see it in operation for another 40 years, and that is part of why he joined the family business. “I would much rather see the business my father built go on than close down after he retires. Ideally, I would like to keep it going for at least another 40 years. Plus, it’s a business where you create great relationships with the wonderful people of Ithaca and neighboring towns. The wonderful friendships you build are more than worth it,” Michael says. Michael Abdulky shows some diamonds to a customer at Mansour Jewelers. 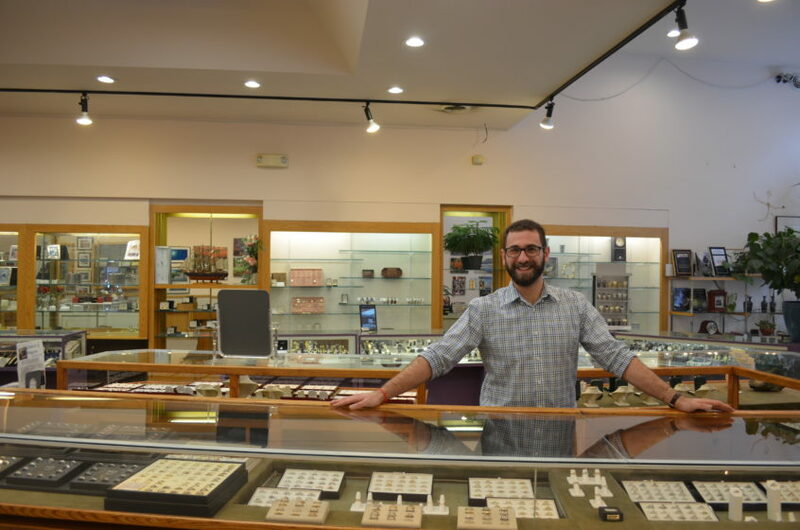 Mansour Jewelers started downtown because they had purchased Altman and Green Jewelers and it just happened to be downtown, so they decided to stay. Michael loves that the business is downtown because of the people and community. “What I enjoy most is the relationships you develop with other shop owners and employees. Even if you’ve never said a single word to some of the Downtown Ithaca community members, both parties know to at least spare a smile and a nod. It truly is a very unique community,” Michael added. What Michael enjoys the most about his business is working with couples and helping them kick off the next step of their lives with engagement rings, and the process that goes into that. “Helping customers start a new chapter in their lives with their significant other is great. I love working one on one with our customers to design a beautiful one-of-a-kind engagement ring and being able to educate them on diamonds and the different metals we can use,” Michael says. When Michael isn’t showing diamonds or helping a shopper with a custom request, his biggest passion has always been hockey. You certainly wouldn’t know that from the store, but if you look closely you can find a few old pictures. Michael still gets out on the ice in a few local men’s hockey leagues, one of the clubs being called the “Toothless Bears”. Asked about the business’ greatest accomplishment, Michael stated that he is most proud of “Earning our customers trust and being able to serve them to the best of our ability.” That has certainly been something that Mansour Jewelers has been proud of since Michael’s Father opened the store in 1980. To learn more about Michael and Mansour Jewelers, visit the store at 140 E State St on the Commons.